For all the evangelical right who still have the audacity to support Trump while calling themselves disciples of Christ, this hopefully will show you how far from being faithful followers you really are. 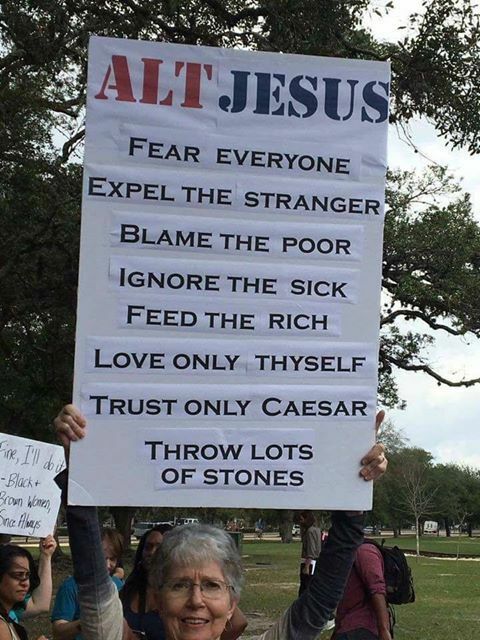 Trump’s values are diametrically opposed to the teachings of Jesus Christ. You can follow one or the other…not both. Your choice is clear as to where your values truly are. This entry was posted in Hunger & Poverty, News & Views, Spirituality & Religious Writings and tagged caravan, caring, compassion., disciples, evangelicals, faithfulness, hunger, Jesus, love, migrants, spirituality, teaching, values on February 3, 2019 by Ray Buchanan. We don’t feed people to change their point of view. We don’t feed people to proselytize them. We don’t feed people “so they can be saved.” Feeding people is not a strategy for evangelism. We feed people because they are hungry. We feed people because we follow the example of our Lord. We feed people to demonstrate God’s love to a hurting world. We feed people because we want to be faithful disciples. We do not feed the hungry to get another notch on our Bibles. This entry was posted in Hunger & Poverty, News & Views, Quotes and tagged Bibles, demonstration, deserve, disciples, ethics, evangelism strategy, faithfulness, feeding, hungry, hurting world, Jesus, love, meal, mltitudes, morality, motivation, notch, point of view, proselytizing, salvation, the right thing on April 17, 2018 by Ray Buchanan. This entry was posted in Hunger & Poverty, News & Views, Quotes, Spirituality & Religious Writings and tagged alt right, blame, disciples, faith, fear, hate, hungry, Jesus, love, poor, religious, selishness, sick, stranger on February 25, 2018 by Ray Buchanan. 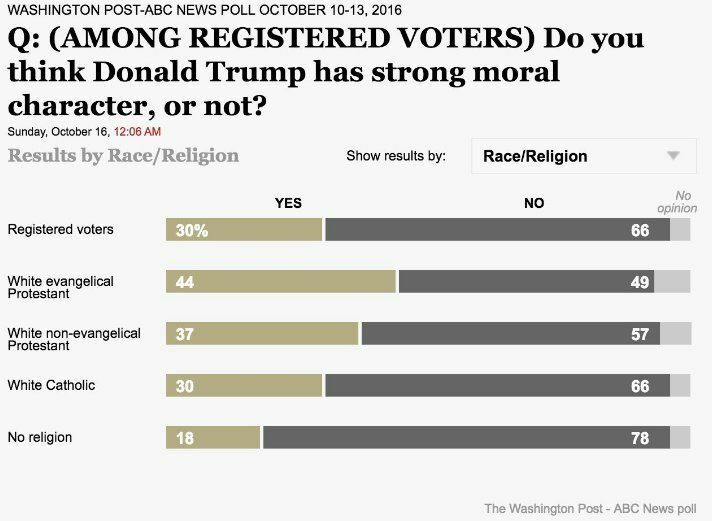 This Washington Post-ABC News Poll from last October should strike fear into the hearts of those who are disciples of the Man from Nazareth. White evangelical Christians were the biggest believers that the #BLOTUS had a strong moral character. White non-evangelical Christians were not far behind. What that reveals about white Christians, especially evangelicals, should start alarm bells ringing in every church in the country. If those who most deeply profess to follow Jesus actually think Trump has a strong moral character, it means that they have absolutely no clue as to who Jesus is or what He taught. The poll does, however, give us a good indication of why the church no longer has the authority and moral leadership it once had. White Protestants need to once again figure out that faithfulness to the gospel of Jesus is not the same as blind patriotism, love of country, or love of power. The most interesting statistic was that those who professed no religion seemed to have the best understanding of the lack of moral character of the #BLOTUS. Is that possibly because their understanding of morality isn’t filtered through the lens of religion? This entry was posted in Facts & Statistics, News & Views, Spirituality & Religious Writings and tagged BLOTUS, Catholics, character, Christians, disciples, Donald Trump's moral character, evangelicals, faithfulness, fear, gospel, heart, Jesus, Man from Nazareth, morality, patriotism, poll, power, registered voters, religion, Washington Post-ABC Poll, white evangelical Protestants on November 16, 2017 by Ray Buchanan. I don’t think Jesus really said that. At least. I cannot find it anywhere in the four gospels with which I am familiar. But what I do find is a clear and direct mandate for all followers of Christ to treat everyone we meet, especially the poor, the hungry, and the rejected, as if they are the Christ. I read straightforward and unambiguous commands by Jesus for his disciples to feed the hungry, visit those in prison and to help those in need. The only thing needed to reach out to help the poor is to love one another just as Christ loves us. This entry was posted in Hunger & Poverty, News & Views and tagged Christ, Christian rock bands, disciples, gospels, hungry, Jesus, laser lights, love, mega church, poor, prison, quotes, sound systems on September 18, 2015 by Ray Buchanan.